Designed by Mr. John Benzene and Mr. Bob Wolf, this magnificent 27-hole championship course consists of three courses: Ujiie, Katsuragi and Saotome. Total yardage is 10,396 yards, par 108. The courses are laid out over rolling hills with a maximum of 10-meter height differential, with the fairways an average width of 70 meters. Contrasting and Unique landscaping can be found throughout, with ponds and waterfalls making not only beautiful and relaxing scenery but offering a challenge on every shot. The course operates a dual green system, popular in Japan which gives the course the option of having a different type of grass for winter or alternating the greens to help with recovery and growing periods, the good news is the greens are still quite large so not too difficult to hit. The driving range is also worthy of note, with a well equipped 17 bay 250 yards covered range with practice bunker and chipping area. There are also 3 large practice greens and a pitching green. Starting with along a long par 5 to begin your round, the first thing you will notice is how mature the course is, now at the grand old age of 44 (most courses in Japan were built during the economic bubble in the late 80's and 90's) the forested areas are very dense and heavily wooded so although beautiful should be avoided! There is plenty of water on this course- 6 out of 9 holes, but as always- aggressive play is rewarded. A favorite is number 7, a downhill par 3 with an almost island green- it looks amazing but is a daunting tee shot, with a nice wave of exhilaration/relief once safety is reached! Is a slightly shorter course from the other two, it boasts a variety of challenges and is renowned for its picture perfect scenery and water features. The 2nd hole is a favorite with members come Hanami time (Cherry blossom viewing) as the entire hole is lined with mature trees and is really quite a site when the in full bloom. The rest of this 9 is characterized with wide fairways and well-guarded greens. Satome poses an enjoyable challenge to every level of golfer with a lot of variety and aesthetically stunning. 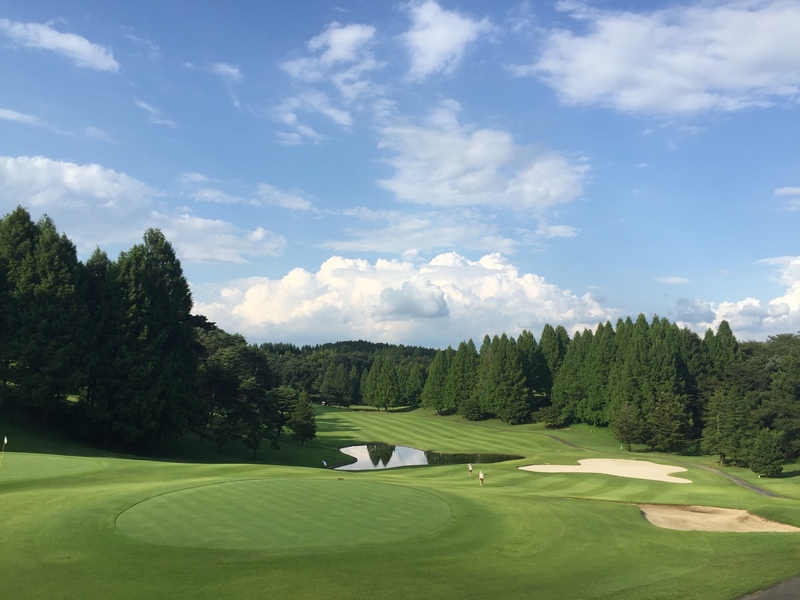 Katsuragi course offers a diverse course layout, bringing challenging long par 3's, tricky yet short par 4's and adventurous Par 5's that challenge all elements of a Golfer's ability. The finishing hole is a most memorable par 4, as there is a lake sitting 210 yards off the tee, and needing a solid 240 yards to clear, an easy shot for many if you bring your 'A game' off the tee! Practice facilities consist of driving range with a covered 250-yard range, as well as 3 practice greens, and bunker shot/chipping practice. open 6am-10pm daily. Relax and unwind at the Hotel green hill located onsite overlooking the course. Enjoy the full service amenities of hotel, swimming pool, onsen, The Creek restaurant and private villas. The restaurant “Creek” features Japanese and international cuisine, course menus feature nabe hot pot, Kaiseki (individual Japanese dishes) and western sets such as beef stroganoff etc. Requests for vegetarian dishes are accepted and kids dishes are also available. For a special occasion try the ‘Tepanyaki’ style steak corner, offering the finest Japanese beef. All Hotel rooms are equipped with ensuite toilet, shower and bath, fully stocked fridge and mini bar, television, and air conditioning. Twin and double twin rooms are available. `Creek` restaurant stands in a beautiful Japanese styled open building, with private dining spaces, open dining room and Teppanyaki grill. The restaurant features Japanese and international cuisine, course menus featuring nabe hot pot in winter (Crab, Shabu-shabu or Kimchee), Kaiseki in the summer (individual Japanese dishes) and western sets such as beef stroganoff etc. Requests for vegetarian dishes are accepted and kids dishes are also available. A particular treat is the 'Steak corner'*, which is Tepanyaki style-- diners can enjoy skilled chefs preparing the highest grade Japanese beef right before their eyes!. Various steak courses are available to satisfy various tastes. *Steak corner is an upgrade option which is about an additional ¥5,000 per person. Private Villas are also available at the Club. Ideal for families and larger groups, giving a home away from home feel yet with all the amenities of the hotel at the guest's disposal. Each Villa has 4 separate twin rooms as well as tatami living room which can double as an extra bedroom. A very popular feature is the private rock onsen, opening out onto the forest to the rear of the property. to the front of the property is the game room with marjan /card table.